The second part of this essay can be found here. The fifteenth anniversary of the September 11 terrorist attacks came and went without provoking quite the volume of critical assessments inspired by past anniversaries. No doubt it helped that there were no copycat attacks on US interests comparable to the murder of Ambassador Chris Stevens in Benghazi in 2011. Yet while Americans begin, slowly, to recover from their panic fear and penchant for “preventive” military adventures, the script that US officials wrote for their global “war on terror” continues to plague the Middle East, even if at times in new forms and with different actors. The murder of three thousand people in the World Trade Center and the Pentagon by reactionary anti-imperialists marked a turning point in the scope of the US empire’s engagements in the Middle East, but failed to provoke a thorough revision either of imperial strategy or of the predominant cultural rhetoric concerning Islam. Fifteen years later, the ideological complexities surrounding Al Qaeda’s sudden assault still require elucidation, even for leftists. To be sure, the anti-imperialist Left has not been remiss in its resistance to the theory and practice of permanent war that George W. Bush and his allies launched in response to the attacks. Mainstream liberals have helped on some fronts, and not surprisingly, since the legal, military and political framework for the “war on terror” represented one of the greatest rollbacks of liberal principles since the US Bill of Rights was drafted. Setting up secret prisons and military courts in other countries and collapsing the distinction between enemy soldiers and criminal suspects into the all-encompassing category of “unlawful enemy combatant,” the Bush Administration helped naturalize a state of affairs in which its Democratic successors could draw up a list of people, including citizens, destined for execution without review by judge or jury. The principle of indefinite “preventive” war against the strategy of terrorism was designed to make peacetime legal procedure obsolete, abolishing the very distinction between war and peace. That Arabs and Muslims in the US and allied European states would be seen as an enemy fifth column in the new permanent state of emergency was a danger to which the leftward end of the spectrum was alert from an early date. Nevertheless, the spectacle of an extreme right-wing cabal attacking the symbols of capitalist and imperialist power in the United States was enough to induce ideological confusion and dissimulation in many camps. Though a few brave souls on the American far Right voiced agreement with their ideological brethren in Al Qaeda by labeling the attacks divine punishment for American tolerance of homosexuality, for the most part western conservatives turned overnight into enemies of the patriarchy when provided with the occasion to overthrow male chauvinist Middle Eastern states. Left-liberal academics and journalists likewise found the Taliban regime a fit target for American military power, and many even followed the administration’s call for an attack on Iraq, which Bush had falsely accused of harboring terrorists. That a foreign invasion to topple Saddam Hussein would only strengthen the reactionary Islamists against whom the war was allegedly fought should have been obvious. It required more foresight to grasp that a US occupation of Afghanistan would have similar consequences, handing a resurgent Taliban anti-imperialist bona fides while empowering another gang of former mujahidin whose commitment to gender equality and social welfare did not greatly exceed that of their rivals. Despite majority support for the indefinite suspension of peace, mainstream culture was never totally in the dark about the contradictions of the “war on terror.” Thousands laughed along as Borat got a rodeo crowd to cheer his call of support for “your war of terror.” Meanwhile, the film Charlie Wilson’s War noted that America’s current sworn enemies had gotten their start in a US-funded insurgency in Afghanistan, fought to weaken the Soviet Union. Yet the war on terror is neither the province of rodeo yokels, as Borat fans may believe, nor does it take a “Zen master” to unravel the twists of fate by which past friends become present foes, as the testy Greek-American intelligence officer in the Tom Hanks movie suggests. Rather, the disastrous course of the last fifteen years are legible already in the script that Washington prepared for its “war on terror,” and which it now ironically shares with rival regimes in Damascus and Moscow. The “war on terror” script is certainly draconian. Preventive war means the right to strike first, while the technical aspects of a worldwide war conducted from the air mean that anyone in the physical vicinity of a suspected terrorist has forfeited his right to life. 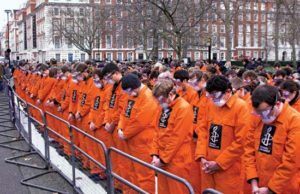 The prison camp at Guantanamo, populated for the most part by people whose alleged ties to terrorists could not hold up in court, symbolized a much broader global pattern by which the raw distinction of friend and foe displaced the legal niceties of citizenship. Yet at the same time the assurances that “nothing would ever be the same” after September 11 masked the continuation of a much older project. American hegemony in the Middle East has always relied on forces whose ideology does not differ greatly from that of its newly dehumanized enemies. Political Islam emerged from the western block’s Cold War attack on Soviet influence in the Middle East. Washington looked on approvingly as Cairo played a double game with the Muslim Brotherhood, maintaining official hostility while allowing the Ikhwan extensive influence over education and public religion. After Nasser’s humiliating defeat at the hands of the Israelis, the Islamization of the public sphere helped absorb discontent with the sovereignty deficit of an economy increasingly subordinate to western capital and a state increasingly submissive to US policy. As Samir Amin has extensively argued, the Arab nationalist world opened itself to conservative religious influences and foreign capital concurrently, and neither force assisted the sovereign national project to which the popular, though undemocratic Arab movement had devoted itself. Where Islamic revivals posed a challenge to the imperialist order, they could be productively channeled. The Islamic Revolution of 1979 unleashed waves of pious militancy in the Sunni as well as Shia spheres, such that the Saudi monarchy was compelled to close its few movie theaters and grant still more influence to the Wahhabi clergy. Yet for some time the disillusioned young aristocrats who might have engaged themselves in forcing their homeland to live up to its rhetoric by removing the “crusaders” from sacred ground, could instead find work fighting godless Marxists; by 1980 US-sponsored mujahidin helped lure the USSR into a trap in Afghanistan, sounding the death knell for the twentieth-century global communist movement. Even the one major exception to this tendency lays bare its operative logic. Revolutionary Iran may well have been stirred by memories of the CIA coup that had subverted the country’s sovereignty for the benefit of western oil profits, but the man who floated to the top amid the revolutionary disruption belonged to a faction that had been hostile to the nationalist project in 1953. Ten years later, the Ayatollah Khomeini assured the Kennedy Administration that his opposition to a land reform project spearheaded by the Shah should not be interpreted as hostility to the monarch’s American patrons. Khomeini made similar overtures to the Americans on the eve of his ascent to power in 1979, though his hand was later forced by left-wing students’ occupation of the US Embassy and a subsequent war with Iraq in which the US publically supported the Iraqi aggressors. While the regime reacted by raging at the Great Satan, the primary targets of its domestic repressions were America’s enemies as well: both secular communists and those who had taken seriously Ali Sheriati’s call for a socialist Islam. 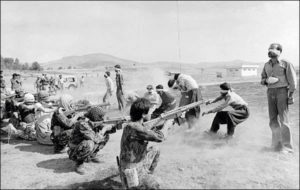 Iranian regime forces execute Islamic-leftist Mojahidin-e-Halq militants, 1982. Aside from the conservative clergy, Khomeini’s social base consisted of landowners and the merchant capital of the Tehran bazaar, hardly an auspicious beginning for a revolution. Three decades on, the Khomeini regime has blossomed into a state-capitalist regional power with the highest number of executions per capita of any nation, and a penchant for applying purportedly Qur’anic measures of torture to workers trying to form an independent union. As it fights the other Islamic State on its western border, the Islamic Republic now eyes détente with the USA. By opening its economy increasingly to foreign capital, Iran’s current “reformist” leadership—actually a neoliberal government proposing superficial changes to the regime’s morality policing—have begun to tap into a vein of American goodwill previously off limits to those who once claimed, however hypocritically, the heritage of Sheriati’s “red Shi’ism” and of an Islamic Revolution. After September 11, the United States proposed to separate “moderate” Islamist forces with which it could cooperate from “fundamentalist” or “radical” Islamists who threatened its security. Support for “moderate Islamists” aimed both to coopt the “fundamentalists” and to counter the secular Left. 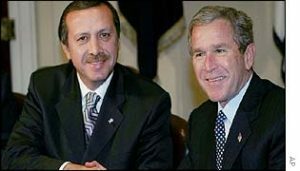 President George W. Bush meets with future Prime Minister Recep Tayyip Erdoğan in the White House, December 2002. Source: BBC. Paradigmatic of this Janus-faced rhetoric is George W. Bush’s statement that “Islam is a religion of peace” and his cheerful assurance that he looked forward to working with Recep Tayyip Erdoğan because both men believed in the same God. Bush’s discussions with Erdoğan began before the latter became Prime Minister, and even before he was eligible to do so, having incurred a penalty from the secular Turkish state for reciting a poem in which minarets appear as weapons. It is easy to detect the hypocrisy of a US President who found good words for Islam while gratuitously killing hundreds of thousands of Muslims: a stance that persists among American politicians to this day, as exemplified by Hillary Clinton’s handwringing over her opponent’s “deplorable” anti-Muslim bigotry while continuing to defend an intervention that led to tens of thousands of Muslim deaths in Libya. Nevertheless, critical analysis of the current situation requires more than accusations of hypocrisy and other ad hominem arguments. Iranian communist Hamid Taqvaee has dissected US rhetoric on Islam as a case of bourgeois ideology depoliticizing a conflict by presenting it in terms of culture. The distinction between “moderate” and “fundamentalist” Islam—often expressed in terms of two types, not of Islamists, but of “Muslims”—masks a political distinction as one concerning the degree or character of religious belief. Taqvaee is certain that the only distinction of interest to US policy makers is one between Islamists who favor US power and those who oppose it. By presenting this distinction in cultural terms, the United States and its European allies get to act as arbiters of civilization while ignoring their own geopolitical involvement in the contested region. The imperialist gamble on “moderate Islamism” has proven successful in the economic arena but deeply flawed from the point of view of security. The case of Turkey under the AKP proves this: lecturing striking workers about “fate” is a good way to improve the profitability of newly privatized industries for the benefit of foreign capital, even while entertaining ties to extremist militias that turn out to be a security headache for the West. The once celebrated “Turkish model” yielded both a decade of neoliberal enrichment and a lot of anxiety about a NATO partner allegedly aiding the Islamic State (IS), and this is not a coincidence. The U.S. establishment rightly guessed that moderate Islamists presented the political leadership most conducive to private capital accumulation in predominantly Muslim countries. Yet the insistence on cleanly separating a “moderate” Islamist movement friendly to the West from a “fundamentalist” front has resulted in the US sometimes feeling compelled to attack the same people it had just previously funded, armed and encouraged: nowhere more blatantly than in today’s Libya and Syria. While the US now wades back into the Libyan front and narrowly avoids a commitment to work with the Kremlin in a merciless war against IS and Al Nusra, both of which brandish American-made weapons supplied by the US’s regional Sunni allies, something has gone very visibly wrong with American policy. The chaos of the Obama years does not indicate a temporary lapse of “leadership,” as the American Right believes, but runs to the core contradiction of the US relationship to political Islam, which will not change appreciably if the US now seeks to balance the Sunni block with the Shia Islamic Republic. Yet the American affection for “moderate Islamism” is not the only thing standing in the way of a consistent, if brutal, strategy for combatting terrorism. Underneath the designs of policy makers seeking to redraw the map of the region or change its ideological coordinates, lies another kind of systemic logic, by turns complimenting statesmen’s “grand strategy,” and by turns undermining it. This underlying logic is the continuance of the warfare state itself, through an economic regime of military Keynesianism in tacit alliance with the weapons industry. Just as US intelligence agencies have systematically entrapped American Muslims in manufactured terror plots in order to justify their own budgets, so too has the de facto alliance of weapons manufacturers and the state’s “national security” apparatus acted to destabilize the Middle East in ways that provide a rationale for “defense” spending. The 1929 stock market crash and ensuing Great Depression taught the managerial class of the developed capitalist countries that an unfettered “market economy” is unsustainable. There has never been one since. Counter-cyclical stimulus funded by large-scale state borrowing has propped up the US economy ever since John Maynard Keynes’s ideas went into circulation in the time of Franklin Roosevelt. The principle has remained in force ever since, whether the beneficiary of stimulus is working-class consumers, the financial sector or the “defense” industry. Needless to say, in recent years the latter two beneficiaries have been predominant. Economists from Paul Baran to Ismail Hossein-zadeh have argued persuasively that “military Keynesianism” enables the US to keep its economy afloat without the kind of state intervention that, by providing human services, threatens to cut into the profits of private capital. In thrall to this model, even Bernie Sanders cannot help but defend large-scale “defense” spending in the name of keeping jobs in his home state. The “military-industrial complex” is the centerpiece of a “political economy,” not simply an assembly of military policies. It cannot be downsized without putting an equally ambitious program of public sector employment in its place, but to do this would be to overturn the applecart to an extent from which even a self-described “socialist” spearheading a “political revolution” shrinks. Moreover, “the political economy of US militarism” locks in place a set of foreign policy priorities. Aid to Israel and Saudi Arabia returns to the US economy in the form of weapons industry proceeds, helping buy the allegiance of those countries, which keep a watchful eye on the oil-rich region. The petrodollar system kept in place by Saudi Arabia as the largest oil-exporter helps maintain the dollar as the world’s reserve currency, enabling the US to borrow money at a level off limits to other states, including allied European countries that play host to the US military. Though it pales in comparison to Roosevelt’s New Deal, the stimulus the US has granted itself since 2008 reflects greater borrowing leverage relative to the austerity-stricken Europeans, and the corresponding recovery has been greater in the US than in Europe. “Dr. 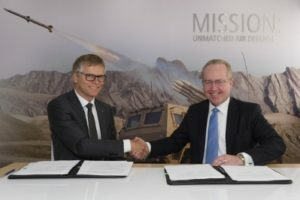 Tom Kennedy, Raytheon Chairman and CEO, and Harald Annestad, CEO Kongsberg Defence & Aerospace AS, signed the 10-year agreement during the Paris Air Show.” Raytheon website, 2015. As long as the resulting violence can be outsourced to the Middle East, there is no reason for the US elite not to pursue an economic model based on “defense” spending. That model kills several birds with one stone, even if it creates collateral damage. Self-created problems like the arrival of IS in “liberated” Libya or the passage of weaponry marked for vetted rebels into the hands of groups labeled “terrorist” are rational from the point of view of the irrational system. When crises provoked by militarism can be bombed into temporary submission, there is little incentive to avoid “blowback.” For such a system lasting success would be failure. The irrational rationality of a system managing its contradictions by spiralling outward to ever-greater crisis is familiar to leftists as the logic of capitalism itself. In America, military Keynesianism wed to social austerity is the state of actually existing capitalism. Its global form includes the predominance of the oil-producing Gulf State monarchies whose influence helps shape any movement for change in line with the cultural and political agendas of those states. On a much smaller scale, something similar may be at work in Russian policy as well: weapons sales to the Middle East make up a not inconsiderable portion of the country’s exports, casting Moscow’s supportive relationship toward authoritarian regimes in Egypt and Syria in a somewhat more sinister light than the Kremlin might wish. To be sure, Russia’s systemic interest in military Keynesianism—and the effect that interest has on its foreign policy—can hardly be comparable to that of the United States. Still, none of the regimes favored by the weapons-suppliers—whether aligned with Washington, Moscow, or both—has much interest in democratic renewal. The regional architecture put in place by the imperial system makes it very hard for a left-wing revolution to succeed. Even the instauration of bourgeois democracy has succeeded only in Tunisia, a small country without extensive oil reserves, far away from the fulcrum of Middle Eastern power further east. In countries governed by pro-American monarchies, the revolt is simply put down and never heard from again, as happened in Bahrain. In an authoritarian republic like Egypt, mechanisms are in place to divert the revolutionary stream in directions unthreatening to the global hierarchy. Long-term US support helped put the Muslim Brotherhood in line to take power upon Hosni Mubarak’s downfall, and when the largest protest contingent in the country’s history turned out one year later to demand the Ikhwan’s removal, a military heavily funded by the US and Saudi Arabia knew how to hijack the public anger in order to reassert its dictatorship. The ensuing Sisi regime maintains strong ties not only to Washington, but to Moscow as well. Meanwhile, in a country directly ravaged by imperial conquest, the disintegration of the nation-state has splintered society along communal lines. Patrick Cockburn writes that the Iraqi Shia militias fighting in Syria alongside Assad’s army feel that they are fighting for the survival of their own communities in the face of the takfiri Sunni onslaught. Much the same can be said for those Iraqi Sunnis who have acquiesced in or furthered the Islamic State’s conquests, harried as they are by the new Shia power in Baghdad. Some of IS’s commanders may be former Ba’athists, but their reassertion of authority would never have taken the form it now takes had a US invasion not toppled Saddam’s nationalist regime. The communitarianism that steps in to fill the void left by the secular nation-state pushes all communities to the Right culturally, since conservative mores are one thing that Shi’a and Sunni political theologies have in common (even if the degree of this conservatism differs, as does the place of women in Iran and Saudi Arabia). Though eccentric Gaddafi’s Jamahiriya may be in a league of its own, the authoritarian “republican” regimes challenged by the Arab Spring are for the most part the calcified remains of Arab nationalism—just as the “Kemalist” Turkish state that Tayyip Erdoğan has now conquered was the corrupted remnant of the ideology of state-led modernization from which Arab nationalism once sprang. These states represent a once proudly anti-imperialist statist tradition now made amenable to foreign capital, their program of social solidarity gradually hollowed out but their repressive apparatus intact. Their oppositions face the challenge of recovering national solidarity once its basis in the state has been eroded. In Turkey, where Islamists have come to power (more or less) peacefully, the solution has been easy: a fusion of the country’s traditional nationalism with conservative religious elements. Washington once hoped that Ankara would serve as a model for the Arab countries, but this was never a likely prospect. Post-colonial nations whose statehood was always more fragile than that of the Ottomans’ heirs, Arab states in turmoil have not well withstood the communitarian pressures emanating from Riyadh and Tehran.